I love breakfast foods, they're without a doubt my favourite, and before I transitioned to a plant-based diet I used to love a good scrambled eggs on toasts with cherry tomatoes and avocado. You'd think being on a plant-based diet there's no way you could get a substitution for this classic food, but actually there's one that fits the bill perfectly! 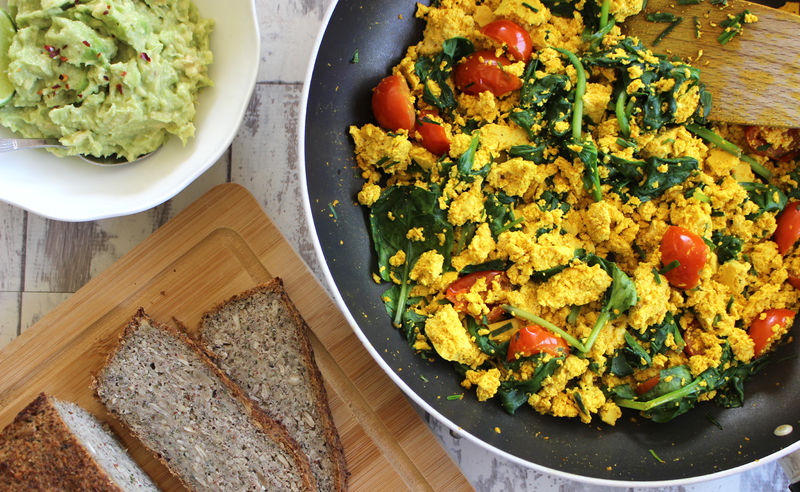 Let me introduce you to tofu scramble..
Tofu scramble is made by crumbling a block of firm tofu into a pan with spices such as turmeric (to give it that yellow colour). 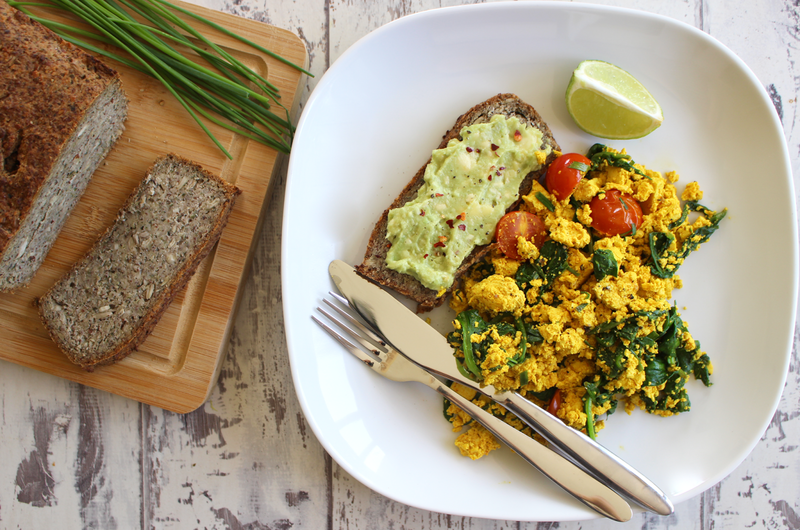 The consistency turns into that of scrambled eggs and the taste is completely delicious - especially when you add in juicy cherry tomatoes, fresh chives and gorgeous spinach! It's the perfect food for a vegan brunch or a quick and easy yet super filling lunch paired with avocado on toast. I don't eat tofu very option because it is a soy product and I tend to avoid anything soy based as much as possible (more on that here) but when you buy organic tofu every now and again will do you no harm. Tofu has a bit of bad rep, it's seen as that bland food you feed vegans, but when it's cooked correctly it's mouth-wateringly scrumptious and extremely satisfying. Tofu is very high in plant-based protein too, and it is in fact a complete protein which means it contains all 8 essential amino acids our body needs (winner! )....perfect for a post workout meal! I like to pair my tofu scrambled with avocado on toast for a truly balanced meal that includes healthy fats, complex carbohydrates and all important protein. 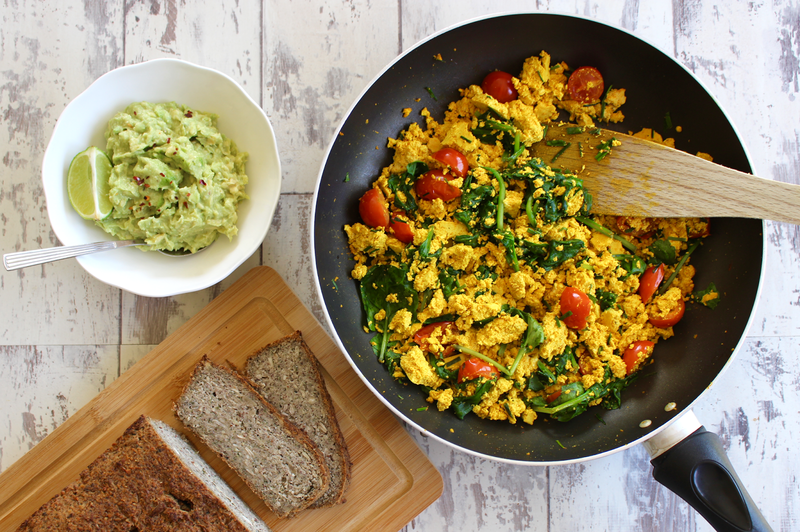 This tofu scramble recipe is so quick and easy, it takes all of 10 minutes from start to finish and will leave your body feeling energised and happy! 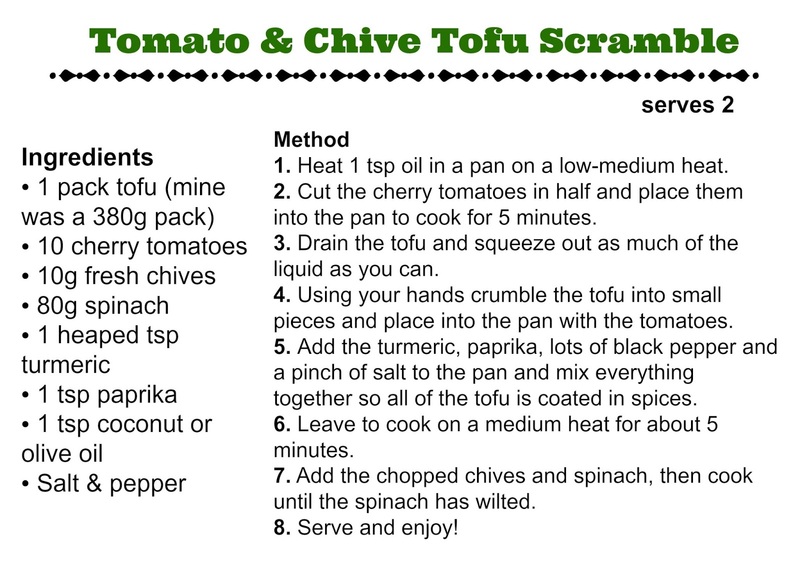 I can't wait for you to give tofu scramble a try, even if you're normally an egg lover I have no doubt you'll be converted!